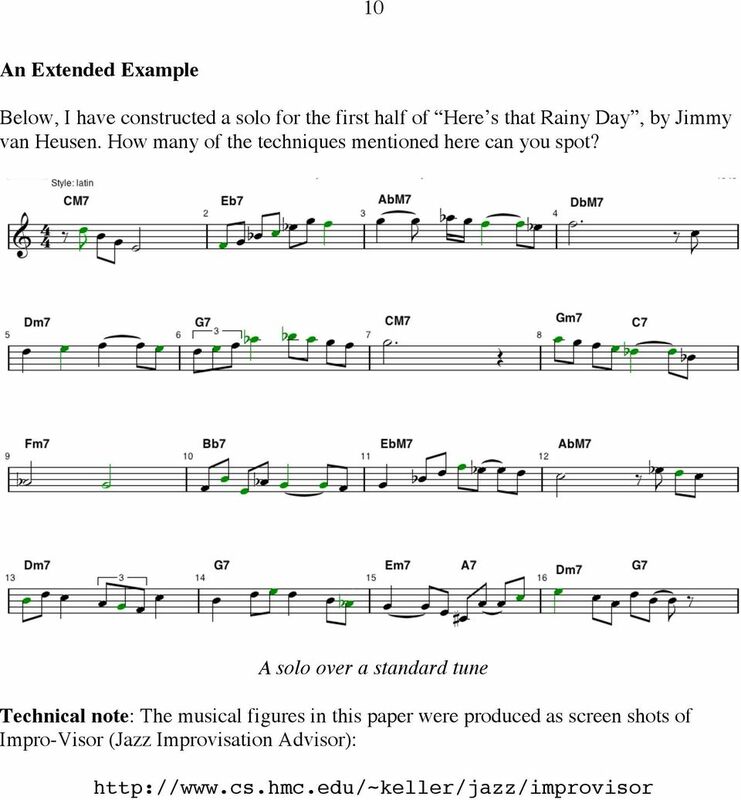 Download "How to Improvise Jazz Melodies Bob Keller Harvey Mudd College January 2007 Revised 4 September 2012"
1 How to Improvise Jazz Melodies Bob Keller Harvey Mudd College January 2007 Revised 4 September 2012 There are different forms of jazz improvisation. For example, in free improvisation, the player is under absolutely no constraints. The listener is also under no obligation to remain a listener, and may tend to leave the scene if what she is hearing seems too close to random noise. Here we concentrate on constrained improvisation, meaning that we are playing over the chord changes of a tune. Know the Tune It is a good idea to have some familiarity with the way the tune sounds with its original melody. Seasoned players can sometimes skip this, because the tune is similar to some other tune. 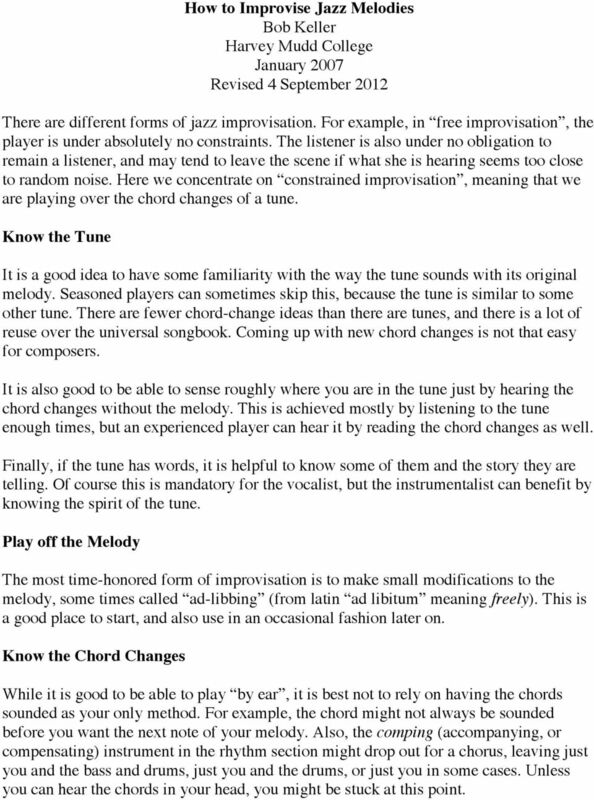 There are fewer chord-change ideas than there are tunes, and there is a lot of reuse over the universal songbook. Coming up with new chord changes is not that easy for composers. It is also good to be able to sense roughly where you are in the tune just by hearing the chord changes without the melody. This is achieved mostly by listening to the tune enough times, but an experienced player can hear it by reading the chord changes as well. Finally, if the tune has words, it is helpful to know some of them and the story they are telling. Of course this is mandatory for the vocalist, but the instrumentalist can benefit by knowing the spirit of the tune. Play off the Melody The most time-honored form of improvisation is to make small modifications to the melody, some times called ad-libbing (from latin ad libitum meaning freely). This is a good place to start, and also use in an occasional fashion later on. Know the Chord Changes While it is good to be able to play by ear, it is best not to rely on having the chords sounded as your only method. For example, the chord might not always be sounded before you want the next note of your melody. Also, the comping (accompanying, or compensating) instrument in the rhythm section might drop out for a chorus, leaving just you and the bass and drums, just you and the drums, or just you in some cases. Unless you can hear the chords in your head, you might be stuck at this point. 3 3 Use Approach Tones In the preceding example, the Bb is also ok because it approaches the chord tone a halfstep away. This idea is often used to get a jazzy sound, even with notes that are not in the scale. Here is an extension of the previous example. Note that the F# is not remotely consistent with the F major chord, but it works because it approaches the G, which is a color tone over the F major. Approach tones (shown in blue) Below, the first E, which is a color tone, also functions as an approach tone. Arpeggio on chord tones (starting on the major 7 th, also an approach tone) The next example shows the tonic of the chord functioning as an approach tone, to the E. Descending arpeggio starting and ending on the major 7 th. 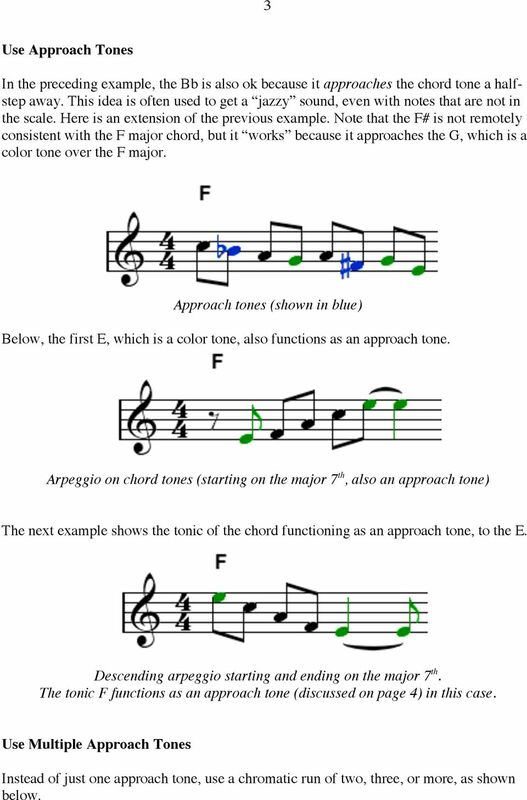 The tonic F functions as an approach tone (discussed on page 4) in this case. Use Multiple Approach Tones Instead of just one approach tone, use a chromatic run of two, three, or more, as shown below. 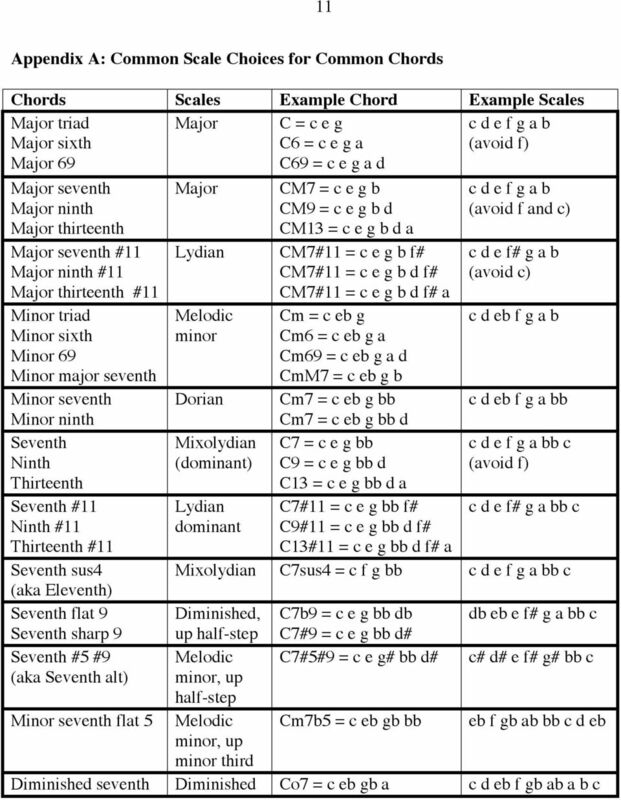 4 4 Know Scales that go with the Chords Multiple approach tones This is not always as difficult as it might seem at first, because the same scale will often work over multiple chords in succession. Here we treat scale as set of notes rather than sequence of notes. Typical scales that go with chords are given in the appendix. For example, the same scale, F major, can be used over all three chords in the II-V-I progression below, although different tones are normally emphasized over each one. 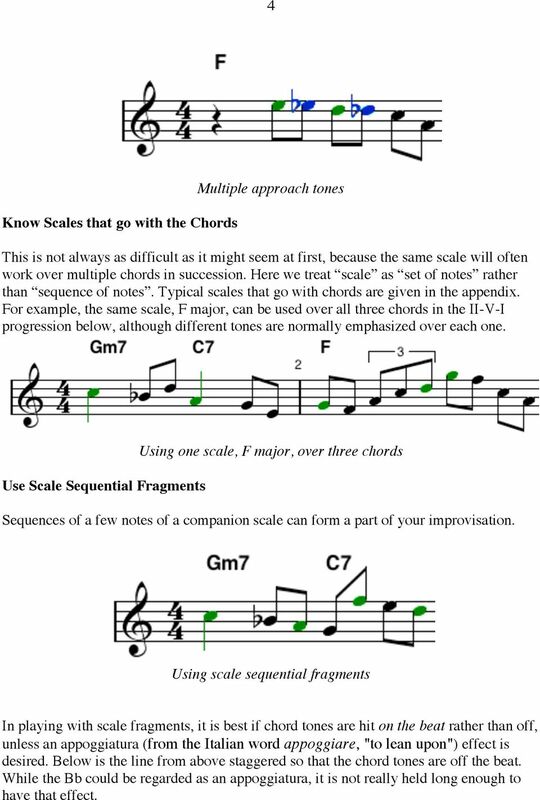 Use Scale Sequential Fragments Using one scale, F major, over three chords Sequences of a few notes of a companion scale can form a part of your improvisation. Using scale sequential fragments In playing with scale fragments, it is best if chord tones are hit on the beat rather than off, unless an appoggiatura (from the Italian word appoggiare, "to lean upon") effect is desired. Below is the line from above staggered so that the chord tones are off the beat. While the Bb could be regarded as an appoggiatura, it is not really held long enough to have that effect. 5 5 Scale fragment with chord tones off the beat Avoid Avoid Notes Avoid note is the jazz player s term for a note that is in a common scale for a chord, but which shouldn t be sustained (say longer than an eighth-note) over that chord because it is very dissonant, to the point of sounding harsh. In a way, it is saying that the scale should actually be reduced to a smaller scale in this particular intended use, by dropping the avoid notes. 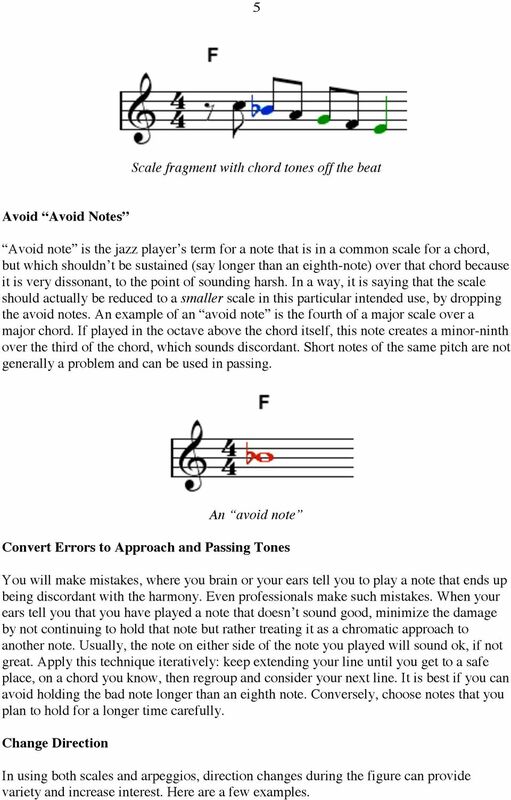 An example of an avoid note is the fourth of a major scale over a major chord. If played in the octave above the chord itself, this note creates a minor-ninth over the third of the chord, which sounds discordant. Short notes of the same pitch are not generally a problem and can be used in passing. An avoid note Convert Errors to Approach and Passing Tones You will make mistakes, where you brain or your ears tell you to play a note that ends up being discordant with the harmony. Even professionals make such mistakes. When your ears tell you that you have played a note that doesn t sound good, minimize the damage by not continuing to hold that note but rather treating it as a chromatic approach to another note. Usually, the note on either side of the note you played will sound ok, if not great. Apply this technique iteratively: keep extending your line until you get to a safe place, on a chord you know, then regroup and consider your next line. It is best if you can avoid holding the bad note longer than an eighth note. Conversely, choose notes that you plan to hold for a longer time carefully. Change Direction In using both scales and arpeggios, direction changes during the figure can provide variety and increase interest. Here are a few examples. 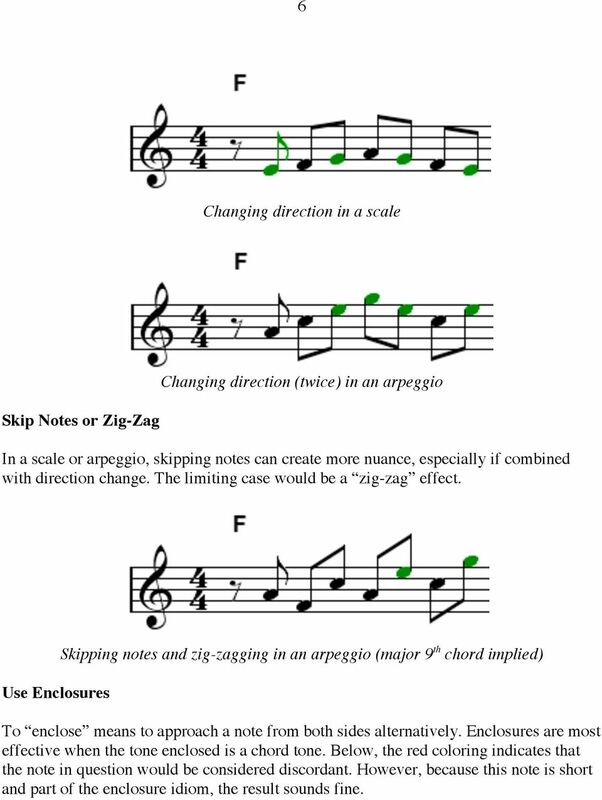 6 6 Changing direction in a scale Changing direction (twice) in an arpeggio Skip Notes or Zig-Zag In a scale or arpeggio, skipping notes can create more nuance, especially if combined with direction change. The limiting case would be a zig-zag effect. Use Enclosures Skipping notes and zig-zagging in an arpeggio (major 9 th chord implied) To enclose means to approach a note from both sides alternatively. Enclosures are most effective when the tone enclosed is a chord tone. 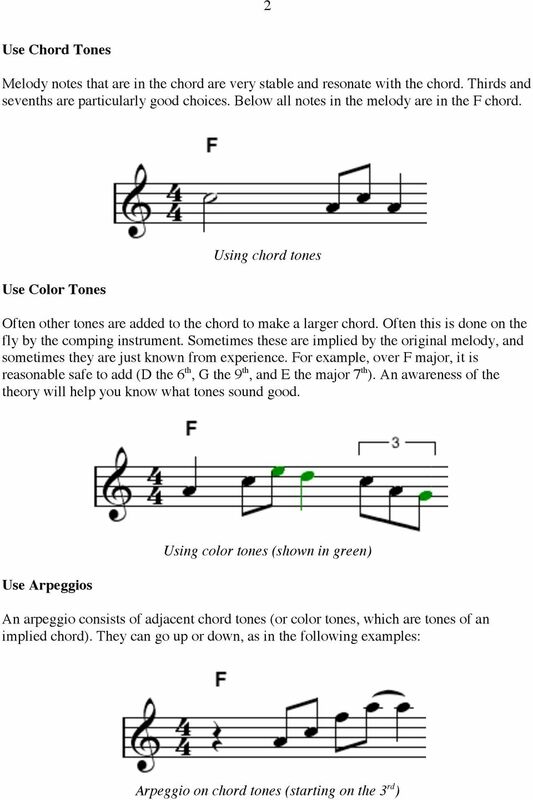 Below, the red coloring indicates that the note in question would be considered discordant. However, because this note is short and part of the enclosure idiom, the result sounds fine. 7 7 An enclosure: Here the chromatic Db and B enclose the C. The D acts as an approach to the enclosure. Use Repetition and Sequencing A good-sounding melodic idea can be repeated immediately, or later in the solo. When the repeated melody shape is transposed to go with a different chord or scale, this is called sequencing. Repetition need not recurr on the same part of the beat, as the first example below shows. For good examples, refer to some Thelonious Monk compositions, such as Straight, No Chaser or Rhythm-ning. 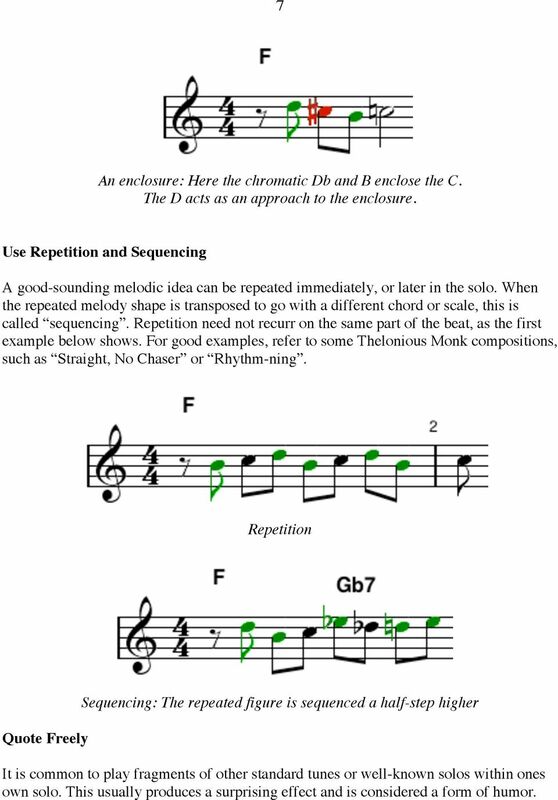 Repetition Quote Freely Sequencing: The repeated figure is sequenced a half-step higher It is common to play fragments of other standard tunes or well-known solos within ones own solo. This usually produces a surprising effect and is considered a form of humor. 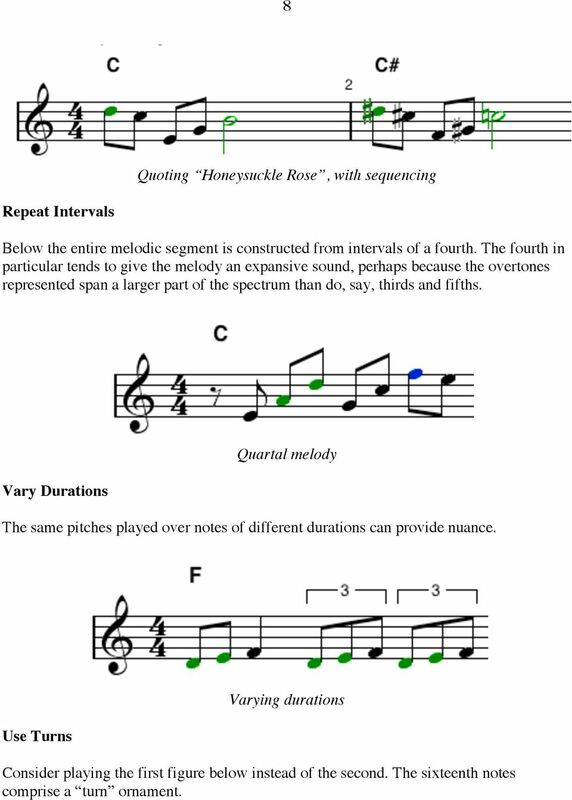 8 8 Quoting Honeysuckle Rose, with sequencing Repeat Intervals Below the entire melodic segment is constructed from intervals of a fourth. The fourth in particular tends to give the melody an expansive sound, perhaps because the overtones represented span a larger part of the spectrum than do, say, thirds and fifths. Vary Durations Quartal melody The same pitches played over notes of different durations can provide nuance. Use Turns Varying durations Consider playing the first figure below instead of the second. The sixteenth notes comprise a turn ornament. 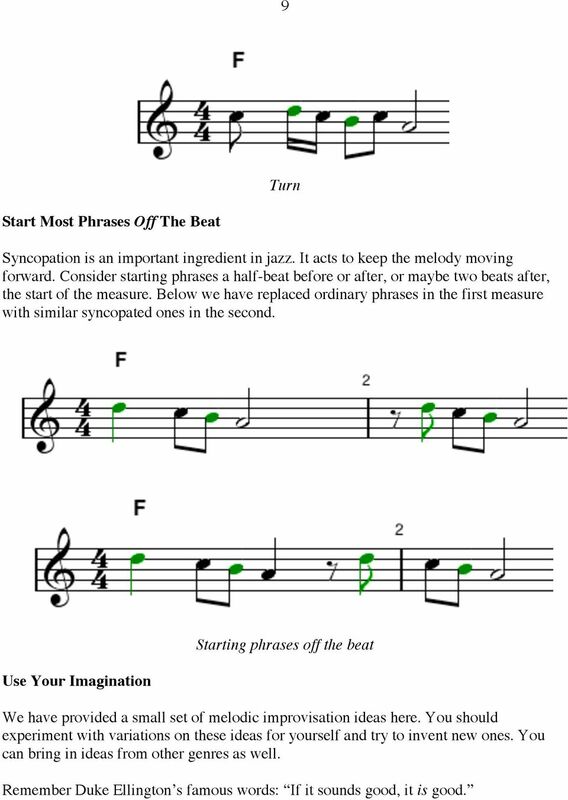 9 9 Turn Start Most Phrases Off The Beat Syncopation is an important ingredient in jazz. It acts to keep the melody moving forward. Consider starting phrases a half-beat before or after, or maybe two beats after, the start of the measure. Below we have replaced ordinary phrases in the first measure with similar syncopated ones in the second. Use Your Imagination Starting phrases off the beat We have provided a small set of melodic improvisation ideas here. You should experiment with variations on these ideas for yourself and try to invent new ones. You can bring in ideas from other genres as well. Remember Duke Ellington s famous words: If it sounds good, it is good. 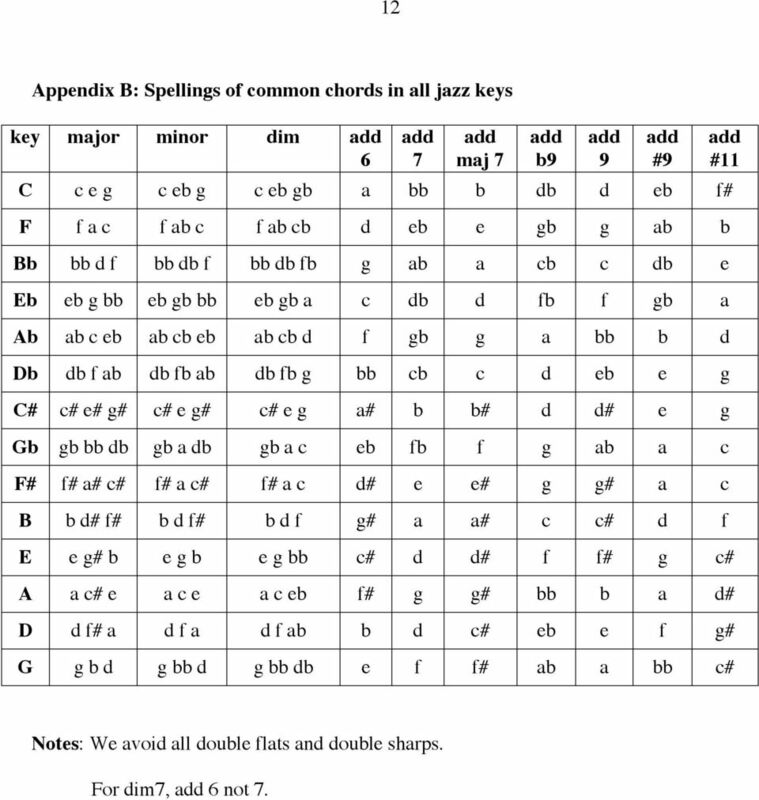 12 12 Appendix B: Spellings of common chords in all jazz keys key major minor dim add 6 add 7 add maj 7 C c e g c eb g c eb gb a bb b db d eb f# F f a c f ab c f ab cb d eb e gb g ab b Bb bb d f bb db f bb db fb g ab a cb c db e Eb eb g bb eb gb bb eb gb a c db d fb f gb a Ab ab c eb ab cb eb ab cb d f gb g a bb b d Db db f ab db fb ab db fb g bb cb c d eb e g C# c# e# g# c# e g# c# e g a# b b# d d# e g Gb gb bb db gb a db gb a c eb fb f g ab a c F# f# a# c# f# a c# f# a c d# e e# g g# a c B b d# f# b d f# b d f g# a a# c c# d f E e g# b e g b e g bb c# d d# f f# g c# A a c# e a c e a c eb f# g g# bb b a d# D d f# a d f a d f ab b d c# eb e f g# G g b d g bb d g bb db e f f# ab a bb c# add b9 add 9 add #9 add #11 Notes: We avoid all double flats and double sharps. For dim7, add 6 not 7. BONUS LESSONS. Copyright 2014, Steeplechase Arts. All Right Reserved. CHAPTER I THE STAFF. 1.1 The most commonly used CLEFS are the treble and bass clefs. Music Literacy for All Developing Musically Literate Individuals in Performance-Based Ensembles J. Steven Moore, DMA Research Data How Many Public Performances Does the Average H.S. Band Present Annually? MAKING YOUR LINES SOUND MORE LIKE JAZZ! 2012 Saskatchewan Curriculum To Accompany Instrumental Jazz 10, 20, 0 ISBN 98-1-10-06-2 1. Arts education (Secondary school) - Saskatchewan - Curricula. 2. Competency-based education - Saskatchewan. Saskatchewan. GOSPELKEYS TM 202 MASTERING WORSHIP CHORDS TRANSCRIPTS SIDENOTES. www.hearandplay.com www.gospelkeys202.com. Minister Jermaine A. MUSIC GLOSSARY. Accompaniment: A vocal or instrumental part that supports or is background for a principal part or parts. Rehearsal Strategies A Night in Tunisia By Reginald Thomas, Professor of Jazz Piano Michigan State University, East Lansing, MI Do you remember the first time you heard this jazz classic, A Night In Tunisia? The pianist has a few functions in a jazz combo. First, he comps for, and interacts with, other players as they solo. The diminished reference is to a C7b9 chord, which expresses the C half-step whole-step diminished scale. The Four Blues and More by Mark White-Whitmark Music Publishing A little knowledge is a dangerous thing. Particularly in the case of music theory where azz is concerned! Too many students become "experts"
Slash Chords: Triads with a Wrong Bass Note? In General. To interpret the music in dancing boogie woogie the dancer have to know something about the music form. In General To interpret the music in dancing boogie woogie the dancer have to know something about the music form. Boogie Woogie music is mostly played in blues schemes. Sometimes you can find swing scheme.